Where: Westmont Ridley-Tree Museum of Art, Westmont College, 955 La Paz Rd. Perched at the entryway to the Westmont Museum of Art are two suspended busts, one a sort of drunken, red-nosed circus clown archetype and the other the inherently fragile, heat-fearing persona of a carrot-nosed snowman. They stare us down as we enter the space, like funny-creepy sentries challenging us to look away, or come on in. Welcome to the strange and wonderful – even smirking and enchanted – world of “tug,” a deceptively cool, lower-case three-letter-word for a show bubbling over with allusions to the grand human comedy, from the philosophically comic tag team of Dane Goodman and Keith Puccinelli. The cherished Westmont Museum, a remarkable art space and local cultural resource entering its sixth year, is starting off its new academic year on a strong note, and a definitively complex one. Two of the more intriguing and individualistic artists to call Santa Barbara home, they have been partners in art crime before, in different ways. Mr. Puccinelli brought his circus to town a few years ago, with a memorable show at the Atkinson Gallery of Santa Barbara City College. It was the last year Mr. Goodman was the director there, and his own art shares with Mr. Puccinelli a certain puckish, serio-comic flair. In “tug,” the artists fuse and melt away the traditional insistence on artists taking singular credit for their work. Who is responsible for which piece, which idea belongs to whom, and who do we blame or credit? The ambiguousness of accountability becomes part of the artistic gesture and aesthetic itself. We’re not always sure whether to laugh or wince at some of this art, and the gray area push-pull now extends to the touch of the perpetrators themselves, nudging the art-going experience into their own private theater of the absurd. Texts burp into the crypto-cartoony pictures as well, such as the alliterative wordplay “hemoglobin, hell’s-a-poppin’, hobgoblin.” In another drawing, a pumpkin-head pugilist breathlessly asks the existential artistic question, “What should be done and what will it mean and what does it matter and why ask anyway and aren’t these questions old and maybe it’s time to move on . . .” Fair enough. Inside the large main gallery, a collection of works serve the twin functions of being discrete entities while also conspiring toward a sense of an installation whole. 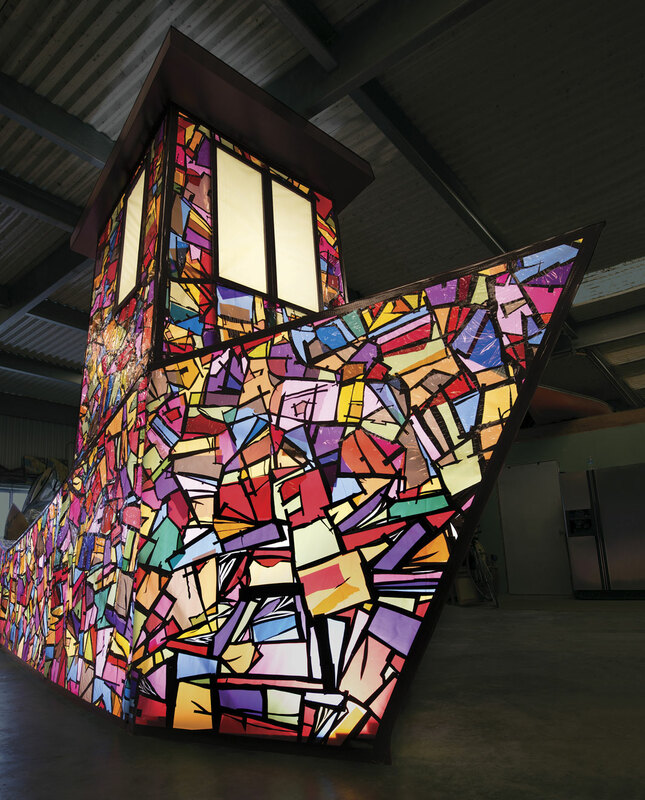 Center stage in the dim-lit gallery is a large boat, with an exterior like illuminated mosaic or stained glass windows (an inherent wink at religious ritual). It’s like a vessel in search of self, in search of curious responses from beholders equipped with individual interpretations, and also in search of a muted laugh. At the tail end of the boat is a perhaps Homeric kite-flying snowman in a spotlight (in a room where the frigid temperature is part of the art). Elsewhere in the gallery are touches of sobriety within the celebratory, from a hand-crafted power plant in one corner to a back window that has been blacked out except for festive bulb-shaped lights, and one menacing plane image threatening to spoil the pending party with impending doom. 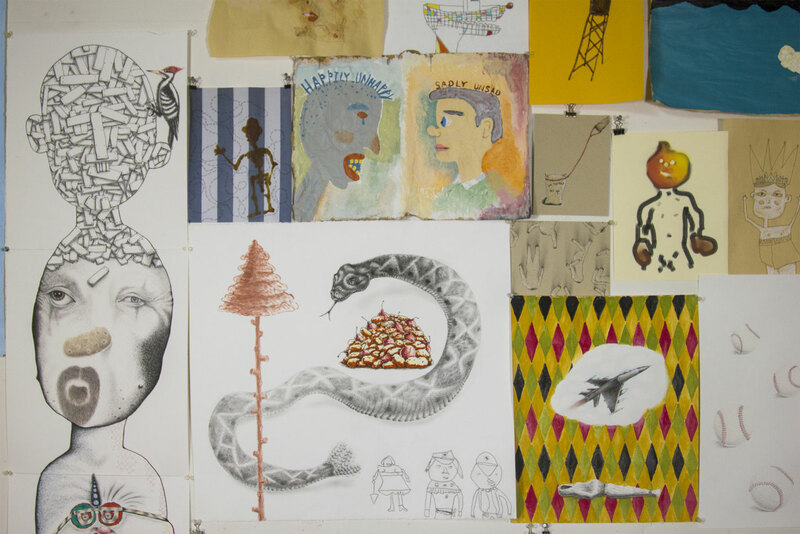 On one wall hangs a raggedy menagerie of drawings, in multiple idioms, sizes, materials and degrees of dark and light, and characteristics both sinister and giddy. Quite by contrast, on the other side of the space-charging boat enterprise is a display of art-as-sleepwear pieces, a lark on first impression with a thickening plot upon closer scrutiny. Innocence meets vulnerability and angst. We find hints of prison garb, harsh headlines on the newsprint PJs, and a black pair of pajamas reading “Joe W. 1950-2001,” serving as wake-up calls. Yet all is not dark and foreboding here, and the oddly charming PJ party wall also has a “sleep tight”-styled coziness about it and a certain Dr. Seuss-ish panache. (Then again, Dr. Seuss had his surrealist hobgoblins to impart, too). Somehow, opposites attract and also refuse to identify themselves in the art of Dane and Keith. Lines of demarcation between good and evil blur, just as the artists’ own creative thumbprints and roles blur and bend. 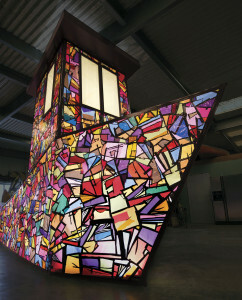 In that way, the “tug” in this art – and between the artists – is palpable, even as it covers its tracks.